Winter is one of the most dangerous times for drivers. Not only are the streets slick with snow and salt but most areas experience an increased amount of wildlife activity. 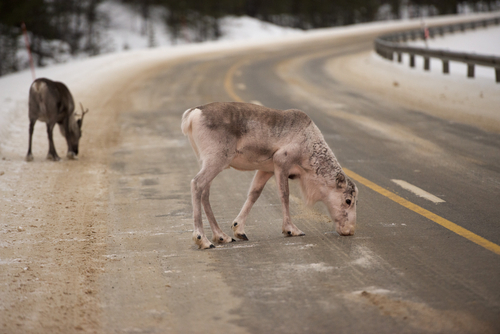 Deer and elk consider salt a tasty treat, meaning it and other treatments attract large animals to the roadways. With temperatures already starting to drop, the collision repair experts at ABRA Auto want to give you a few tips on how to avoid a wildlife-to-vehicle accident this winter. Animals are especially active during dusk, dawn, and overnight, so remember to be particularly vigilant during those times. However, it helps to decrease your speed no matter the time of day. Not only will doing so help you scan the side of the road for wildlife but it will also give you more braking time in case an animal runs in front of your vehicle. Sometimes an accident is unavoidable. If you are involved in a wildlife-to-vehicle accident, you can rely on ABRA Auto for the best collision repair in town. They offer both dent removal and glass repair to restore your vehicle to its original condition. To see a complete list of their automotive services, visit their website.